Phased-locked loop (PLL) oscillator circuits are the standard implementation for tunable frequency sources these days, as opposed to LC tank circuits with either mechanical (variable capacitor and/or inductor) or electrical (varactor) control elements. Crystal oscillators have been around for many decades, nearly a century in fact, but it was not until the advent of PLL circuitry using solid state digital ICs that such stability and accuracy was available across a wide range of frequencies. As author Klaus Peter states, using a huge bank of fixed frequency crystals with selector switches, even when using double and triple conversion schemes, is totally impractical from physical implementation, production, and cost perspectives. These early PLL designs did not have the convenience of single-IC circuits as are widely available today and at a very low price. The plethora of USB-interfaced signal generators on the market now is testimony to that. Fig. 1 - Simple phase-locked loop circuit locks oscillator to reference. An ideal tuner must be sensitive and selective, have good spurious and image rejection, have good capture ratio, and provide recovered audio with low distortion. Since low distortion is achieved only when the r-f signal is properly tuned, low drift is essential to maintain this condition. For operating convenience, a method of station pre-selection as well as the ability to scan should also be available. The readout accuracy should be such that there is absolutely no doubt as to which frequency or channel is being received. Manual fine tuning to reach the center or low distortion point of a signal should be eliminated because mistuning is probably the greatest source of distortion in FM reception. The most obvious and simplest solution to eliminating fine tuning of the oscillator is to use a crystal-controlled oscillator. Since the oscillator frequency is always 10.7 MHz above the receiving frequency, 100 crystals covering from 98.8 MHz, to 118.6 MHz in 200-kHz steps would be required for all channels. A 100-position rotary selector switch would serve as a tuning knob and provide a mechanical or electrical readout determined by its shaft position. This system effectively eliminates the need for fine tuning but is far too expensive since the quartz crystals alone amount to about $200 in parts cost. Using frequency mixing techniques, it is possible to bring the number of crystals down to 20 for dual conversion and 15 for triple conversion but the additional switchable filter requirements also make this approach expensive. Furthermore, multi-conversion designs may be troubled by spurious response and poor image rejection performance due to the nonlinearity of the mixer circuits. The Crystal Oscillator. The oscillator of the Scott 433 digital FM tuner is crystal controlled on every frequency but uses only a single quartz crystal as a reference standard. This is accomplished by making the oscillator part of a digital phase locked loop (PLL) circuit. In order to understand this principle, let us look at the simplest PLL circuit which locks an oscillator to a reference frequency. When the system shown in Fig. 1 is first turned on, the voltage-controlled oscillator frequency will not be exactly the same as the reference frequency. 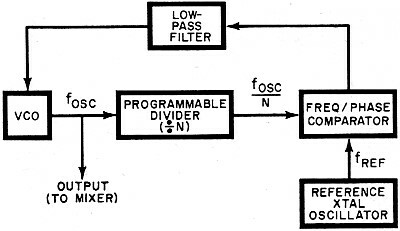 The output of the frequency-phase comparator is an error voltage which tunes the VCO in a direction to minimize the error until phase-lock condition is established and fosc = fref. Since the control voltage for the VCO is ideally a dc voltage, the low-pass filter is used to remove any high frequency components which might be present at the output of the comparator. Scott 433 digital FM tuner circuitry is described in text by its designer. In North America, stations are assigned to fall on 100 channels from 88.1 to 107.9 inclusively with a spacing of 200 kHz. Since the channel spacing requirement is 200 kHz, the reference frequency of the crystal oscillator must be 200 kHz if its multiples are to fall on each FM channel plus 10.7 MHz. 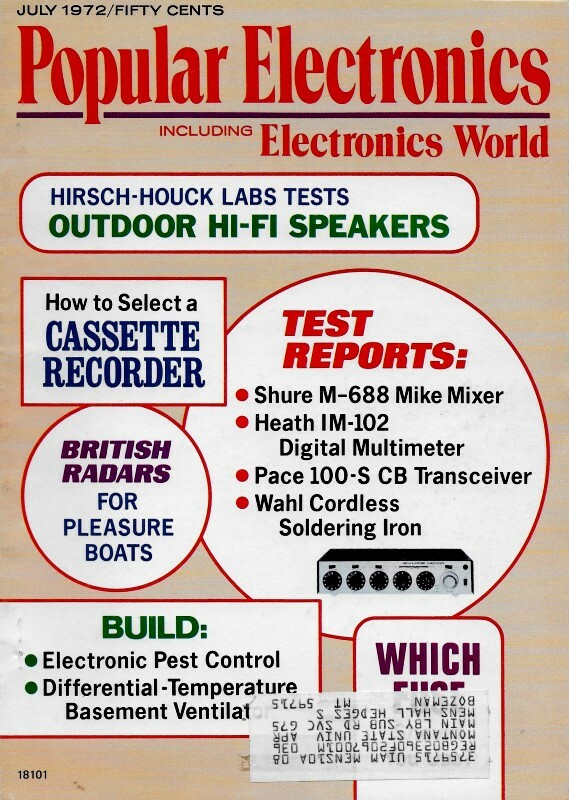 Let us calculate what the divide ratio must be when the tuner is receiving 88.1 MHz or the bottom channel on the band. This means that the voltage-controlled oscillator will be at a frequency of 200 kHz multiplied by 494 or 98.8 MHz. The next channel higher at 88.3 MHz will require a divide ratio of 495 and so on until 107.9 MHz, the top of the band, is reached at a divide ratio of 593. For the tuner to scan the entire FM band, the programmable divider must therefore be able to divide from 495 to 593 inclusively. Consequently every time a new station is desired, the divide ratio must be altered. Since several IC counters are available with a variable modulo or programmable count sequence, one of these is used here. The divide ratio is altered by inserting a binary code which affects the length of the count sequence and hence the divide ratio. 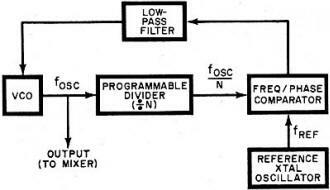 Each channel or frequency requires a unique code which is presented to the divider. The code itself is derived electronically and can be generated in a sequence which will make the tuner appear to scan across the FM band. It actually "steps" across the band rather than scans continuously since it only pauses (phase locks) on assigned channels. The tuner can also be tuned or programmed by cards which present a binary code to the code generator which in turn decodes it and passes it on to the programmable divider. The card system overrides the other forms of sequential tuning and allows instantaneous pre-selection of stations by using the. desired card. Digital Frequency Readout. The tuner uses the familiar cold cathode neon indicator tubes which were chosen for reliability, long life and reasonable cost. The display is actuated by the same binary code which the code generator supplies to the programmable divider to set its divide ratio. Aside from displaying the frequency in MHz which the tuner is receiving at any given moment, the display serves as a self-checking feature for the code generator as well as the card reader. The binary code from the code generator is decoded into decimal form and used to drive the display; if an incorrect or non-allowable code is presented to the divider such as one caused by a damaged card, the readout will immediately show the error. Fig. 2 - The programmable divider allows tuner to synthesize multiple frequencies. The digital readout in the tuner is not simply hooked up to. a frequency counter which counts the oscillator frequency minus 10.7 MHz. The frequency counter is a "passive" addition which will work with any existing tuner while the PLL design is an "active" system which requires an electronically tuned r-f section. In the passive system, manual fine tuning is still required. With a PLL system the oscillator is forced to lock at each channel center, which always falls exactly on the assigned frequencies of the broadcast stations. The digital PLL system provides an r-f oscillator of crystal stability on all frequencies plus an absolutely accurate digital display of the frequency being received. The binary code generator setting the divide ratio allows the operator to scan the FM band manually at a preselected speed or to let the circuit search for a station or stereo station automatically. If one station of known frequency is desired, a pre-punched card can be used to tune to it immediately. This feature will appeal to the discriminating music listener who has a small number of favorite stations and selects definite programs. The scan feature on the other hand might appeal to the less critical listener who usually scans the band until he hears something he likes. Other Features. One of the extremely useful by-products of this system is automatic interstation muting. The tuner just won't tune between channels. Noise muting is also provided however for silencing empty channels; this type of muting is defeated by a front panel switch. During the automatic "Stereo Station" scan mode, all mono stations are muted. When tuning from one station to another regardless of which tuning mode is used, the sound disappears without the usual transient swish or thump and reappears out of complete silence again with the absence of annoying noise bursts and distortion. All muting is done after the multiplex decoder by two FET series-gate switches which reduce the signal by at least 60 dB in the muted condition without introducing a dc transient. The r-f section in the tuner employs selected high-gain, low-noise FET's for both r-f gain and mixer functions. A FET is also used for impedance matching and low noise in the first stage of the i-f amplifier. Two 6-pole elliptical filters shape the passband of the i-f and achieve a selectivity in excess of 70 dB which allows this tuner to select any one station from a crowded area on the band. The "Station" light on the front panel indicates the presence of a carrier and is actuated by a zero-crossing detector coupled to the output of the ratio detector; the station light is also a double check on the PLL and reference standard because it is actuated only if the station is tuned to exact center. On noise which is present on empty channels, the station light is extinguished automatically. The "Stereo" indicator will light up in the presence of a 19-kHz subcarrier when the signal level is sufficient to give an acceptable signal-to-noise ratio. A "Card Program" indicator shows at a glance whether or not card tuning is being used. Aside from providing instantaneous pre-selection of station frequencies, the card serves as a permanent memory since the code generator's volatile memory loses the station code when power is turned off. Trend to Complexity. The trend in consumer electronics is toward greater circuit complexity made possible at low cost due to the use of integrated circuit technology. The circuit designer gains flexibility in achieving performance goals and operating convenience for the customer. Unless proper steps are taken, however, servicing of this type of equipment can become a problem as troubleshooting time and test equipment expenditures increase drastically. The best approach seems to center around modular construction with each module representing a functional sub-assembly which can be replaced with no more effort than the vacuum tube in an old TV set. Fault location is greatly simplified by the fact that each module performs a definite function which can be monitored individually with a minimum of test instruments. Once the faulty module is replaced by the service shop, it is sent back to the factory where automated test facilities localize the fault to a component on the subassembly and it is either repaired or scrapped. This module exchange policy has been used for some time and is gaining in importance as equipment complexity increases. The customer also has the advantage of knowing exactly how much the repair will cost if it is done after the warranty period has expired because definite module exchange prices have been established. Even service shops with limited facilities can repair a unit as complex as the digital FM tuner if a set of PC modules or even another operating unit is available. Each module is simply in­terchanged with a new one until the fault disappears. Although the complexity of circuitry has increased, reliability has increased also. Through the use of MSI (medium scale integration), the number of hard-wired interconnections has actually decreased thus avoiding a significant number of failures. By screening TC's in incoming inspection, testing assembled modules under worst case conditions before they are mounted into complete units, and extensive life testing of finished products, the failure rate has been reduced to a fraction of what it was a few years ago. The IC's used as building blocks in the digital sections are of the standard variety already well proven in the computer industry and second sourced widely.